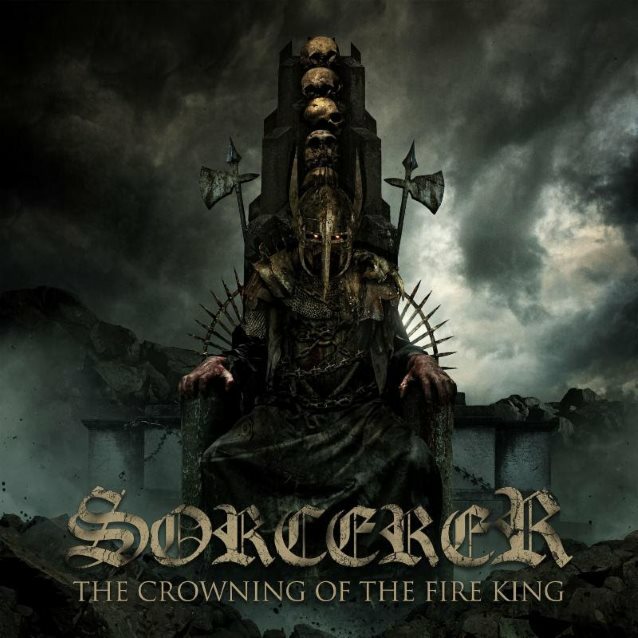 Swedish epic heavy doom metal warlords SORCERER will release their new album, “The Crowning Of The Fire King”, on October 20 via Metal Blade Records. The official lyric video for the disc’s latest single, “The Devils Incubus”, can be viewed below. SORCERER comments: “We have aimed to write an album with diversity and intensity, an album that we want to listen to ourselves. SORCERER emerged out of Sweden in the late 80s and was one of the very early bands to champion what is now known as “epic doom metal.” Besides genre pioneers CANDLEMASS, groups like SOLITUDE AETURNUS, WHILE HEAVEN WEPT and SORCERER were among the few groups around representing this style of metal. During its existence, SORCERER produced two self-financed cassette releases, both of which quickly became underground cult classics regularly hailed by metalheads as some of the finest of the era. After a few personnel changes, the group disintegrated in 1992 and since then some of the bandmembers went on to find some success with other groups. Bassist Johnny Hagel achieved greater success in TIAMAT and later SUNDOWN. Vocalist Anders Engberg has also made a name for himself with several other bands he has fronted, such as LION’S SHARE, TWILIGHT and SECTION A. In March 2015, SORCERER released the critically acclaimed “In The Shadow Of The Inverted Cross”. SORCERER played several festivals in support of the album — Sabaton Open Air and Rock Hard Festival, among others, with the latter especially being a huge success for the band, selling out their entire merch supply even before finishing their set. 2015 also saw the release of the EP “Black”, which consisted of three songs left over from the “In The Shadow Of The Inverted Cross” sessions, as well as an acoustic version of the track “Prayers For A King”. In the end of 2015, the band started to write material for a follow-up album to “In The Shadow Of The Inverted Cross”. Progress went pretty fast and ten new tracks emerged out of the royal epic doom chest. The songwriting carried on throughout 2016, and in early 2017, they went into the studio to record. In the early summer of 2017, the album was ready to be mixed by the very talented Ronnie Björnström (AEON, CUT UP, 220 VOLT), who also turned the knobs on their last album. The mastering this time was expertly handled by Mr. Thomas “Plec” Johansson (SOILWORK, WATAIN).